Every job search has its share of problems. Here are some examples and what to do about them. This a guest post by Tim Tyrell-Smith. If you’d also like to guest post here on JobMob, follow these guest post guidelines. As a kid growing up in the United States, I was influenced heavily by public television. These shows included Sesame Street, The Electric Company, ZOOM and Mister Rogers' Neighborhood. Entertainment and education all in one. Seen all over the world, I imagine. The song found my ears as a Muppet skit on Sesame Street. According to an entry on Wikipedia, the song has German origins dating back the the 1700's. Then fix it, dear Henry, dear Henry, then fix it. With some straw, dear Henry, dear Henry, some straw. As you might expect, this song can go on forever but thankfully it does not. The solution from Liza involves the need for a bucket which, yes, has a hole in it. And the local hardware store is likely closed. The good news for Henry is that he has Liza there, to sing with and solve problems. We all need a Liza. Some of us need a more aggressive Liza, one who will even hit us over the head with the bucket when we need it most. If you're having trouble in your job search, you just might be like Henry with a hole in your proverbial job search bucket. In that case, here are 5 things that might be leaking out and causing problems in your job search. 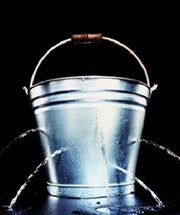 So, what does a hole look like in job search and what is actually leaking out of your bucket? If you wake up every morning, hop on the computer and search for jobs (via Monster or AllJobs) for hours, there's a hole in your bucket. You are losing valuable time every day. Time that could be spent meeting with real people, completing informational interviews, and using Linkedin, Plaxo or Xing to find contacts at your target companies. Since you cannot and should not search for work 12 hours a day, focus your key search hours on the right efforts. So you stand up at the big networking event when it is your turn to speak in front of 50 other people, some of whom might be able to influence your job search. You speak too softly, don't make eye contact, don't deliver a compelling message and forget to share your job search objectives. When will you be able to fix that one? You've just left a forgettable impression on 50 people. Fix this leak by learning to speak with a powerful voice, find at least 10 people to reach with your eyes and work hard to develop a compelling story for your career. Be interesting. If you are uncomfortable meeting new people. If you stumble in conversations. If your focus in networking is to solve your own problems. Networking is about giving and getting. In that order. No matter your stage in job search. Even if just beginning, there is always someone worse off than you. Someone you can help. And, of course, word gets around. If you are a giver, you will get from others. If you are a taker… well, the leak will get worse. When your resume or CV is too long, unstructured or lacking measurable accomplishments, you give little option to a hiring manager or recruiter. You give them a reason to filter your candidacy to the “HOLD” or “NO” folder. If you do not create a significant impact in two pages, you will miss out on phone interviews and you will be less likely to be invited into HQ. Also, make sure you have materials prepared for all occasions. Going to an event where the search is performed more informally? Have a “one sheet” version of your resume and carry networking business cards that include your contact information, key strengths, a clear positioning statement and your specific job search objectives. Sometimes in job search a little bit of frustration sneaks into your mind. Perhaps that interview that you thought went so well… didn't. But you feel a need to reinforce your skills via a phone message, e-mail and a hand-delivered note in the hopes that the company will realize they made a mistake by not offering you the job. Not only is this damaging to your psychology, it does not endear you to the hiring manager. If they want you, they will call. Make sure you have lots of irons in the fire to prevent a hyper-focus on one position – even if you think it is your dream job. So now it's time to inspect your bucket. Are you seeing any leaks? Look for a Liza in your network. And learn how to sing. Tim Tyrell-Smith, a veteran consumer packaged goods marketing executive, started writing Spin Strategy in September 2008. Tim writes and creates from the perspective of a hiring manager and a job seeker focusing on the strategy and psychology of successful job search. He lives in Mission Viejo, California, USA. Follow him on Twitter at @timsstrategy. This article is part of the 3rd Annual JobMob Guest Blogging Contest. If you want Tim Tyrell-Smith to win, share this article with your friends. If you enjoyed this article, you'll also find interesting What Is Your Biggest Job Search Problem? [POLL RESULTS AND ANALYSIS]. Subscribe to JobMob via RSS or email and follow me on Twitter for more ways to overcome your job search problems. So true. My extensive job searching lately has been really frustrating. No matter how badly you want the job, it’s sometimes difficult to stay focused and submit interesting, correct materials–and even when you do you are hoping the position still exists by the time you apply. New sites like 1stGiG.com solve so many of these problems. Focused on early career individuals, it creates a match on both the employer and seeker side. It launches later this fall, doesn’t require resume submittal, and saves much time and money. Keep an eye on it! Great summary of some of the more common issues that face job seekers today. I find that the more people you speak, there are common threads of behavior that ring true not only for the successful, but for the people who are struggling. I think your summary identifies some of the more common mistakes people continue to make. Jacob, thanks again for the opportunity to participate in this great event! Great post. The “leaky bucket” metaphor really rings true and the “leaks” are for real life examples we can all learn from. Also, really enjoyed the engaging writing style. Tim does a great job of getting his points across. I admit, I’ve had some of these leaks. What I’ve found helpful, though painful at times, is having a trusted group of friends who can give you their “hiring manager” opinion while reviewing your resume and hearing your elevator speech. They can also act as your cheerleaders and hold you accountable to what you’ve promised to complete over the past week.